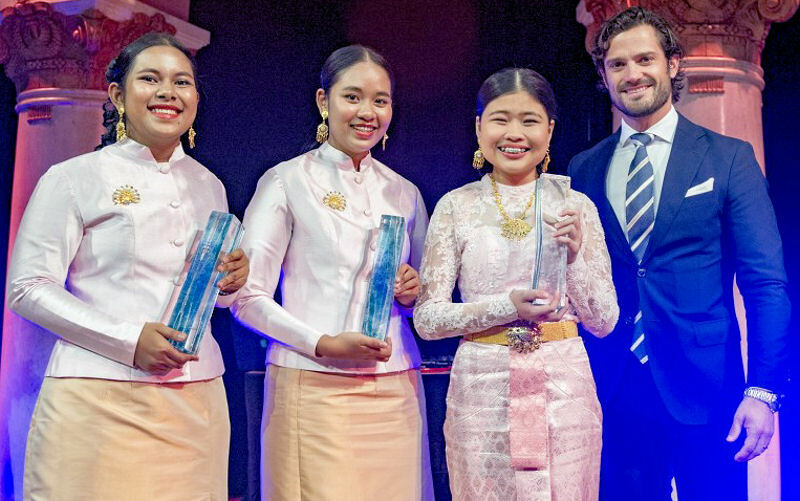 The team of students from Thailand — from left, students Kanjana Komkla, Sureeporn Triphetprapa, and Thidarat Phianchat — received the international 2016 Stockholm Junior Water Prize from Prince Carl Philip of Sweden. Photo courtesy of the Jonas Borg, Stockholm International Water Institute. Taking inspiration from a flowering plant, a team of students from Thailand created a device that retains stormwater and can help irrigation. 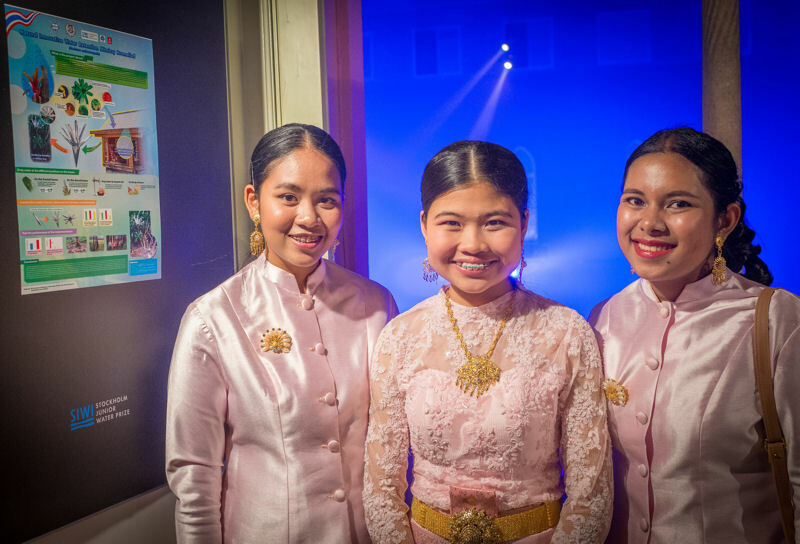 During World Water Week, Sureeporn Triphetprapa, Thidarat Phianchat, and Kanjana Komkla stepped onto the stage to receive the international 2016 Stockholm Junior Water Prize (SJWP). The team’s project focused on research into the natural efficacy of plants shaped to collect and retain water and the design of a prototype that mimics the water retention capabilities of the Bromeliad plant. Additionally, the team conducted field testing of the technology and installed the device on rubber trees in plantations, according to a Stockholm International Water Institute (SIWI) news release. For their winning project, Triphetprapa, Phianchat, and Komkla, designed a system that captures and retains stormwater for irrigation through a design that mimics the water retention capabilities of the Bromeliad plant. Photo courtesy of the Jonas Borg, Stockholm International Water Institute. “It has already proven to be scalable and is now being tested in the field by hundreds of farmers who are now benefiting from the inspiration from beautiful plants, which have an exceptional capacity to collect and store water,” according to the SJWP jury in its citation. The research presented a simple solution that could help make a big difference and help the world achieve United Nations-specified Sustainable Development Goals by starting at the local level, said Torgny Holmgren, executive director of SIWI. The student team from Mexico – from left, Eunice Yaneli Masegosa Gaona, Gabriel David Alejandro Trujillo, and Carlos Castellanos Dominguez – receive the Diploma of Excellence from Prince Carl Philip of Sweden during World Water Week. Photo courtesy of the Jonas Borg, Stockholm International Water Institute. The student team from Mexico received the Diploma of Excellence. Their project combines an artificial wetland, electrocoagulation process, and a purification system to promote the use of reclaimed water for agricultural activities and school uses. The team of Gabriel David Alejandro Trujillo, Eunice Yaneli Masegosa Gaona, and Carlos Castellanos Dominguez built and operated a system to demonstrate the process, the news release says. 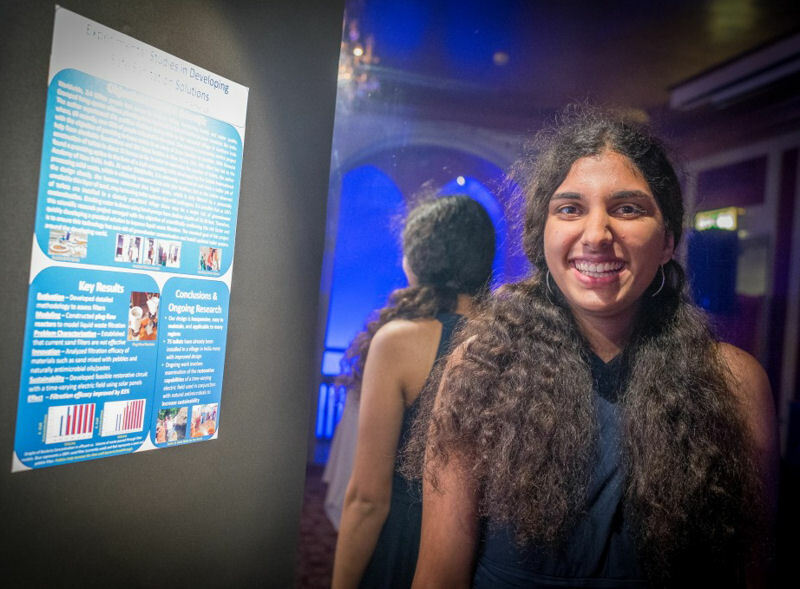 Nishita Sinha represented the U.S. at the international competition. Photo courtesy of Jonas Borg, Stockholm International Water Institute. The winning team received $15,000 in addition to the prize sculpture, and the team’s school will receive a $5000 grant. Diploma of Excellence recipients received $3000 in addition to the diploma. The Water Environment Federation (Alexandria, Va.) and its Member Associations organize the regional, state, and national SJWP competitions with support from Xylem Inc. (Rye Brook, N.Y.). The international SJWP competition is administered by SIWI, and sponsored by Xylem Inc.